Pricing can be challenging in business. 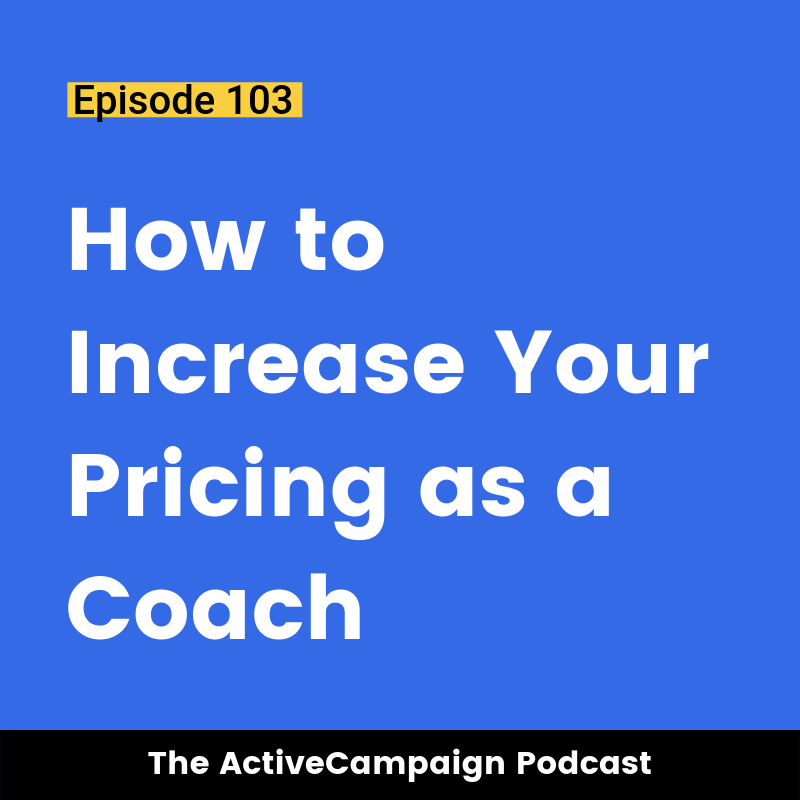 Charging what you’re worth is a common topic among coaches of all varieties. It’s time to learn how to overcome that challenge. Fabienne Raphaël is a business building coach, speaker, and podcaster. She helps aspiring and underpaid coaches become highly paid experts by building their coaching business. Chris Davis: 00:24 Welcome to the ActiveCampaign podcast. I’m your host Chris Davis. On this episode, I have a Fabienne Raphael and she is a business building coach, speaker and podcaster. What she does is she helps aspiring and underpaid coaches become highly paid experts by building their coaching business, and that’s exactly what we talk about on this episode. It’s how she took one of our clients as a case study and help them triple their pricing, thus allowing them to make more in their business and work less. Chris Davis: 00:59 Does that ring any bells anybody? Does that not sound like the ultimate result of automation? Fabienne and myself, we talk about this in great detail in this episode. We leave no stone unturned. If you’re struggling with what it takes to increase your pricing, I’ll give you a hint. It has nothing to do with the product. It has everything to do with the person. But that’s all I’m telling you. Listen to the episode. Enjoy. Fabienne, welcome to the podcast. How are you doing? Fabienne R.: 01:32 I’m doing great. How are you? Chris Davis: 01:33 I am trying to keep it together because we had just a brief touch base before the podcast and we probably should have recorded it and just used that as the podcast. So I’m just trying to stay composed. It was quite the unanticipated time of laughter and fun. So hopefully listeners you will appreciate. We’ve already warmed up our throats and our tummies to laugh. So hopefully you will laugh as well as learn. Fabienne, tell us a little bit about yourself and your background. Fabienne R.: 02:12 Okay. So it’s no straight line background, right? Because when I was a kid, I didn’t think that I would become an entrepreneur or have my own business or helping people through the internet because actually it didn’t exist. So I was raised in a family where my parents believed into having the same job for 25, 30 years and having a high education, going to college and then have that diploma, and having the doors open for the best job possible and stay there forever. Obviously, it didn’t happen this way. Fabienne R.: 02:50 While I was actually still an employee, I met my life partner and he’s also my business partner and he started opening my mind to having my own business, to personal development, to attending conferences and learning about several things. So I guess he had a good influence on me and eventually I made that switch, but from being an employee to a consultant. So I’m a trained physical therapist, so I used to be an employee. So I switched into being a consultant. So doing more contracts. Then along the way, I’ve had a healthcare agency, home staging business, helping people in renovations and all that stuff. Fabienne R.: 03:34 Then all of a sudden, my partner found this huge conference about marketing and when I attended I was like, oh my god, this is it. What’s this thing, marketing? I didn’t know anything about this. Going forward with my online marketing education, I realized that this is something I want to help other people with it. Actually, it was less time consuming than let’s say having my home staging business where you have to go to homes and bring your stuff and do a lot of traveling, transporting all the furniture and everything. So I figured, well, let me do that online and let me help people with this. So yeah. In a nutshell, this is my story. Chris Davis: 04:25 So you went from a physical therapists to consulting physical therapist? Fabienne R.: 04:32 Exactly. And then in my health care agency, I had professionals, mostly therapists that I would actually find contracts for in establishments like hospitals or clinics. So I had a few employees doing that business and at that time, it was great because a lot of places were lacking therapists. Chris Davis: 04:55 Interesting. So where did you even get the idea to turn your employer or businesses like your employer into clients? Fabienne R.: 05:06 What do you what do you mean? I’m not sure I understand the question. Chris Davis: 05:08 When you went from being a physical therapist to consulting physical, right? Fabienne R.: 05:16 That was all my life partner. I mean, he’s brilliant at finding great ideas. He was like, well, let’s just try that, for example. Then this place I was working for as an employee, I resigned and then I think it was two weeks after, I sent them a proposal as a consultant and they hired me. So that was my first contract. I was like, wow. Chris Davis: 05:42 You know what? Fabienne R.: 05:42 This is so easy. Fabienne R.: 05:49 I’m kidding. I was just lucky, I guess. Chris Davis: 05:50 But I will say this, and I say this from the personality type in myself that thinks through 5 or 10 times before act once. Being an entrepreneur has forced me to shorten that and sometimes act before you think, just figure it out later. But there is something to be said of that blind action and that blind implementation where it’s just like, hey, you didn’t know how vast or how large that ask could have been. Right? Going in, sending. But you just did it. Right? Fabienne R.: 06:24 I totally agree with you on that. Because I know that when I speak to prospects, let’s say just before they sign up with me, and then I’m asking questions about since when they had this dream of building their coaching business. The majority of people are like, well, it’s been in the back burner for years or I’ve been thinking about for the last 5 years, 10 years. Then they just don’t take action because they’re so overwhelmed with all the information online and they don’t know which action to take first. Most of them what they do is they get into that learning cycle which never ends because they’re never ready enough. Right? Fabienne R.: 07:06 So they get into the no, I’m not ready. So let me perfection that. Like, let me take that one more course and let me try that one more thing. Of course, well, behind that is because they’re really afraid of maybe failing or not figured it out like quite yet. That’s funny because when you start taking action, you realize that a lot of that anxiety and fear goes a bit away, right? It’s not as if you’re 100% confident, but when you take action, you have the impression of actually moving forward and closer to your goals. Chris Davis: 07:45 Yeah, it’s always more overwhelming, more exhaustive and just bigger. It’s always bigger in your head and exhaustive in your head than it is out of your head. Chris Davis: 07:59 I always … It’s you’ll be carrying around this idea, I need to do this but I need to create this contract. Then I need to do this. Then I need to make sure my website is this and this, right? And then you say, I’m just gonna write it down. Then you write it down and within five minutes it’s like three things and you’re like, but wait a minute. Where’s the rest? There’s got to be more to it. So that process of letting the idea not mature in your mind before you get it out. Get it out early, let it mature in life. Fabienne R.: 08:33 Exactly. How many times it has happened. You might start a business and then eventually or along the way you evolve as a person and your business shifts into the people that they want to serve and stuff like that. So you just shift with it and just go forward with that, right. There’s nothing wrong doing that. I think people want to get it right the first time too much sometimes. This is the limitation and this is why they’re not taking action. Of course, we know if you don’t take action and don’t do anything, well, how will you ever start your business? Chris Davis: 09:13 Nothing will ever change. So your life partner and business partner, is he entrepreneur-minded? Did he came in just entrepreneur minded or is he more of the encourager of entrepreneurship? Fabienne R.: 09:26 No, he’s entrepreneur-minded a lot. He was a lot more than me when you when we met and all that stuff, and then I guess that … I think that I was, but it was hiding in those profound layers of my personality, I guess. Because I never thought I would … Actually, I was such a shy person. I would feel better hiding in a corner and people not noticing me than being out there and just talking to people and all that stuff. I used to be that person. So for me being in business and promoting my stuff was kind of like weird. Chris Davis: 10:06 Yeah, sure. Fabienne R.: 10:06 So he was already like that and I think I really evolved into discovering that I had the potential. I had always been a leader it’s just that I hadn’t owned it at that time. But now I do because I made that work on myself. But it’s so refreshing to realize that you thought it was not possible and then now I’m actually doing it and feeling great with it. Chris Davis: 10:37 It’s interesting how I look at my life and even my children as they grow up. My daughter is 12 right now and I look at her and then I’m like, man, has she always been like that? But then I look at old videos of her being two or her being three and I’m just like, wow, she was always that way. Then I look at myself and there’s things about us, we are who we are, it’s just our life experiences. We can choose to be educated from them to discover more about us and then act out or live out that discovery. It sounds like that’s what you’ve done. Is given that push and given that support, you were able to identify some things that were always true about you but translated in a different arena that made you come alive. That fed you more. Fabienne R.: 11:29 You’re totally right about that. I want to add that sometimes also it’s within the journey that we experiment like the people we meet and our environment. So the people that tell you stuff as a kid or growing up or when you try to do something new. If you’re not lucky and have many people discouraging you or telling you stuff that’s not true but you believe them, then slowly it just makes you shut down your voice and not necessarily wanting to own what you want to share with the world. Fabienne R.: 12:05 So as a kid, I was really outgoing, talking all the time and very kind of like extrovert. But then I guess I became introverted because when I was at school as a kid, teacher was telling me I was speaking too much, like I was talking too much. So in class I had to shut up. Eventually, it became like, when I speak I annoy people so I might as well not speak anymore right? Which is a bit … Like when you’re a kid you had this reasoning that you don’t necessarily have as an adult but that’s how I was experimenting it. So I guess along the way I became like that. Fabienne R.: 12:47 But I would still play sports and be a leader on my team. I would still be playing music, let’s say in an orchestra and then still being a leader in there. I would still do other stuff that would show me I had those abilities. But inside of me, I didn’t believe in it, I guess. It’s funny because I did a personality test lately and I had done that same test about, I think it was six or seven years ago, and actually at that time, seven years ago, I was introvert and now I’m total extrovert. I realized that actually I was extrovert. Like, when I was really young, that’s what I was. Finally, I’m back to my normal state, I guess. Fabienne R.: 13:34 I’m back. Chris Davis: 13:34 It’s nothing like being passionate about what you do and building a model in your business that supports who you are and what you’re passionate about. If it’s a lifelong journey and people get there at different phases in life, you just get there. Everybody just get to the destination. In fact, that was really the topic of today was, one of your clients has reached that destination to where they were able to charge … I won’t do the spoiler alert, I’ll let you dispel how much more. But after working with you, they were able to charge much more than prior. When I read it, I just know I … I understand the coaching field. Chris Davis: 14:27 I do mentoring of marketers and I do mentoring of high school and college students. So I realize it’s all about the mindset and I had a marketing mentor early in my career. It was hilarious because I was nervous. It is my first time selling something online and he looked at the price and he was perplexed. He was like, I’m trying to think what I would give somebody for that price. I thought he was like, he’s thinking [inaudible 00:14:57]. He was like, maybe a high five, maybe like a shout out on the podcast. Chris Davis: 15:05 He’s like, I just don’t know what I would … I can’t find anything worth my time that I would charge that low on. He said that and it was just like all of the air just like, oh my gosh. I had done all these mental gymnastics just to get up to charge … Okay, transparency moment. It was $50. It was $50, Fabienne. I’m just like, oh my gosh, are they gonna pay me $50? Fabienne R.: 15:31 Oh, my god. Chris Davis: 15:33 You fast forward now, I’ll let you know off the record how much I charge for it now. Fabienne R.: 15:40 Yeah. Of course. Chris Davis: 15:41 Greatly. It was a great amount and the only difference was my mindset and my willingness. Chris Davis: 15:45 So talk about that a bit. Talk about this client, how they came to you, what you helped work with them through and what was the result? Fabienne R.: 15:55 Okay. That client I want to talk about is … Actually, he didn’t mind about me saying his name. So his name is Cable Jones and he does heal coaching. When we started working together, Cable had major hurdles about his words, I guess. The money that he was charging for the transformation he was providing to people was just not … It was not a good fit at all. He was charging actually under $100 for things that would be life changing for people. So he does heal coaching, he’s a healer. So he helps people with, not only sometimes it could be physical pains and some other times it could be like mindset blocks or things that are limiting you from realizing your dearest goals or achieving something in your performance as an athlete. Fabienne R.: 16:55 So he has kind of like a wide range of influence. When he told me that, I was like, “Are you serious?” Like, this is what you’re charging? When we spoke about it, we spoke about the results that he … Because he’s still working with me. He was like, what you did to me is like opening me to really owning my self worth. Because at that time he was working in a job where he was actually earning I think it was maybe $20 an hour and he was stuck in his mind that this is what he should charge for his business. So his mindset was limited to doing 20 to 40k with this business yearly. He never saw the possibility of going to six figures in his business and all that stuff because he thought that it was not possible. Fabienne R.: 17:59 What we worked on is, of course, like just stretching his brain a little bit to this idea of, imagine that you are actually talking to a prospect and you tell them that you only charge $100, let’s say. Then to that same prospect, you say that you charge … I don’t know. I just give an example like that, like $500 or $1,000. What do you think the prospect will think about you if they know you charge 100 and you say you’re providing that huge transformation compared to if you charge 1000 and you’re providing that you transformation. They’ll be like, there’s no way I can get these results if he charges me only $100. Right? Fabienne R.: 18:42 So we worked on, of course, like delivering a great offer, being able to work remotely like charging clients per month instead of charging them like per session. Actually, now whenever he’s talking to a prospect, he’s able to nail his price and feel confident with it. People are actually coming to him knowing what he charges and paying him for it because this is the kind of transformation he provides. One thing that he said really was kind of life changing for him is that as a coach … With my background as a physical therapist, I’m a very empathetic person and I studied a lot of psychology. So being able to put myself in a place of my client is something that I can really do well. Fabienne R.: 19:36 So sometimes it would happen that we talk about a process or we talk about something and he would not have implemented it, for example, yet. So instead of pushing him to do it or just like saying, well, what are you doing? Like you’re not doing anything or whatever. I would just try to understand why he would not go forward with that and actually, after that he told me that this is something he appreciates because sometimes you need some time to process some information. Especially when you’re doing changes with your mindset, it takes time. He said if you would have pushed me, I would have just backed off. Fabienne R.: 20:20 So my job as a coach is really to be the person who helps him or who helps whoever I work with to realize that for themselves and being able to go to that next level. So that’s what we’ve been able to do. So he came from charging like, I don’t know, like maybe it was a month he was just charging in the hundreds and now he’s judging in the thousands per month. So without like giving you the exact number because I want to respect that, but now like this is the kind of offer he makes to his prospects and it’s working for him. Fabienne R.: 20:55 He’s attracting so many better clients, of course. People that can pay him on time, that do not complain or do not say, well, I’ll think about it. No, they know what they want to accomplish, they say it, he’s the right person to help them, they sign up and they get those results. So, yeah. In a nutshell, this is what we’ve been working on and it’s been working pretty well for him. Chris Davis: 21:21 That is amazing. People who have received any form of quality coaching around sales always know that it’s the result that you’re selling, right. Not the means to get the result. Because when you get familiar with the means, you start devaluing it. If you look at a basic web developer, I could spin up a website and 10 minutes, I’m not going to charge $1,000. But you’re not selling the means, you’re selling the result. Chris Davis: 21:52 And how valuable is that result. You know what, Fabienne? This is what I found. I found I find that selfishly get in the way and make pricing about us when it has nothing to do with us. It has everything to do about the transformation we’re promising. So if we truly believed in a transformation and understood that transformation, we would move out the way by assuming or getting in our head saying, it’s so easy, they just need to do … Nobody will pay me that. It’s not about you, it’s not about what you do, what you can or can’t do. It’s about their transformation. Fabienne R.: 22:33 Yeah, exactly. Fabienne R.: 23:19 The other important thing, though, also is the process that you have to go through to own that price and to be able to say it without feeling uncomfortable. Because when you’re on a sales call and you’re saying, I don’t know, let’s say you say it’s $1,000. If you like, it’s, it’s 1000 … It’s $1,000. So wait a minute, like what? You’re not sure? How much is it? Like 1000 or 800 or I don’t know. So the thing is, everything with the energy or the fact that you believe into what you could get as results is extremely important when you want to nail those clients because sometimes some people like, I don’t understand, it’s not working. Fabienne R.: 24:07 I mean, everything is not going well. They’re in that negative cycle and then they think that nothing’s working, and then when they get on the phone, it’s like a needy type of sale and I want your money type of sale. Then, of course, people will feel that energy and they’ll just feel repelled, they won’t feel attracted to what you have to offer. So I think that this thing is very important too. You have to feel comfortable with the results you can provide and how you say it to your prospect. Chris Davis: 24:38 Yeah. I find that more true with sales and marketing, especially if you’re the one doing the sales. Sometimes you can kind of mask over some of your insecurities in marketing, but in sales you show through. So if you’re not confident in your pricing, there is no level of inflection you can put in your voice that will make people believe like yeah. Even if they want to believe, there’s so much unconscious communication that happens both in-person and virtually that people have no clue about. That energy, people pick it up. Chris Davis: 25:15 They may not be able to pinpoint, but it’s they’ll be excited and then you keep talking and for some reason, they start having doubts and start thinking about alternatives or start going the other way. It’s because you’re in … Just exactly what you said, your energy from your belief. If you don’t believe it, if you’re not familiar with the value, you’re not willing to embrace that, then it’s going to be extremely difficult, next to impossible to communicate that to through your sales. Fabienne R.: 25:43 So, so true. So to come back to Cable, actually, he was able to double his income within maybe half of the time that he was doing it and doing not as much work because he used to work like 40 hours a week. Let’s say for the whole year, he did 40 hours a week at this prior job. And now with his business, he works maybe four or five hours a day, so working half the time and within those six months, he was able to double his income that he had made the year before. Chris Davis: 26:15 Beautiful. Now, there’s one thing you kind of snuck in there that I want to highlight real quick. You talked about identifying a model for him. You talked about changing pricing, you had a monthly model in there, instead of charging per visit, and things of that nature. When it comes to modeling a business, we’ve talked about marketing. We know you went to some conferences and it opens your eyes up. But that doesn’t always … That’s not always a one-to-one to business modeling. Is that something that you just naturally gravitate towards or was it something that you intentionally sought out is different models for different businesses? Fabienne R.: 26:59 I would say, of course, it’s unique to what people are offering, and especially for him since it’s heal coaching, it was an outgoing type of support he’s giving to his clients. So it’s not as if they have one session and it’s over. Most of the time they need several sessions within weeks or within months. So we had to find a way to package his offer to make sure that he was, first of all, getting paid what he’s worth for the amount of work he was providing to his clients. So that’s why we figured that for him monthly investment from his clients is the way to charge for him. Fabienne R.: 27:43 But other people, it could be like, if they have an offer that is just one session and they’re looking to charge that or they’re doing a retreat or they’re doing some type of event, then we’ll have to evaluate, okay, so what’s the best pricing for them depending on what’s the transformation they’re providing and what type of people they want to attract at their event. I would say it’s something that is very personal to each and every single business. It’s not a cookie-cutter come in and I’ll show you how to do this. Then don’t don’t try to go another route then this route. It’s not like that. I think it has to do with to go with the personality of the entrepreneur also. Something that has to fit with what he’s capable or she’s capable of doing. Chris Davis: 28:39 Yeah, absolutely. The model in which you execute your business with is just as important as your desire in your business itself. Fabienne R.: 28:50 Yeah, exactly. While are some people more comfortable in doing launches and doing online courses, some others are more comfortable having retreats, some others like coaching one-on-one, others group coaching. There are several ways to have your success in your business. This is going to be like my rent for this podcast. I hate it when I see online that people are selling their stuff and they claim that their stuff is the only stuff that works. It’s so much crap. Fabienne R.: 29:25 I mean, as we said before, everyone has a model that they stick better with and they could be successful with that model. So, yeah. I’m sick of those lies just saying, go with this and you’ll make sure that. I mean, no, you’re not sure that. What if it’s been very successful for someone and it so doesn’t fit with your values, but you’re still trying to do it. So of course, it’s not going to work out for you. Chris Davis: 29:51 Right, right. Yes. Absolutely. There are no cookie-cutter solutions in business. There are templates. Right? Chris Davis: 29:59 For you to start from but you most definitely will not end there. Some people like the blank canvas, some people really do. I find myself a lot of times earlier in my career as an entrepreneur, liking the blank canvas. Like starting from scratch and saying, hey, I’m just going to create something. Then as you mature a bit, you’re like, no, what’s worked, what’s proven, let me start there, make my improvements. Because once you have a certain level of expertise, there’s no way you could just take someone else’s stuff. You’ll take it and you’ll start critiquing it like, well, I liked how they started but the second sentence is a little off. The button color doesn’t really match. Then before you know it, it doesn’t even look anywhere near what you started with. But that’s the journey, right? That’s the process. Fabienne R.: 30:49 It’s fine to be inspired or model but it’s not nice to copy. Anyways, when you do that, there’s no way it’s going to work out because it won’t sound right. Chris Davis: 31:03 Yeah. You can see what they do, but you don’t see how they make it work for them. You’re looking and saying, they’re posting on Facebook. They’re doing this, they’re doing that. Yes, you could mirror that, but you don’t know on the backend what it takes for them to do that and what results they’re getting. Maybe you want different results and they’re happy with just likes and followers. But you actually want revenue. So here you are mimicking someone whose model is not even based on revenue is just likes and followers, and you’re wondering why there’s no money coming in. Fabienne R.: 31:40 That’s a good example. I like it. Chris Davis: 31:43 It happens all the time, unfortunately. But no, Fabienne, thank you so much. This has been great. You know what, I didn’t anticipate going too deep into the sale psychology, but we didn’t … I shouldn’t even say too deep into the sales psychology, more so too deep into the mindset that helps the sales psychology. But I’m glad we did because it’s a topic we haven’t touched on the podcast, if any. So I just have this strange suspicion if somebody’s listening right now that is on the fence, they’ve been struggling with their pricing, maybe they know they should be raising their price, maybe not. But whatever the case is, they’re not making enough money. They have the value but their bank account doesn’t reflect that. To that individual, what would you say to them? Fabienne R.: 32:42 I would say, get some help. I would say, actually … Because the thing is, especially when people are starting or they’re doing something but it doesn’t work out, sometimes it’s because it’s either they didn’t seek out for the right help or they want to do it all on their own. Entrepreneurs have this high ambition. I think as an entrepreneur, you must have that or else, I mean, why are you into this entrepreneurial journey? So sometimes they falsely think that they could do it all alone. Fabienne R.: 33:20 Mistakes, they are costly, they could cost a lot of money and a lot of time. When you work with someone that has done these mistakes before you and that completely gets you and know where you want to go and can give you these results, it’s totally worth it to work with someone just help you unlock that. As soon as you do that, well, of course, you’ll be able to reach that next level. Finally, own the fact that you are so much more and your bank account will reflect the amount of transformation you provide for your clients. Fabienne R.: 33:59 I don’t know there. There might be something wrong with the society because so many people are stuck into. They’re afraid of charging or asking for money, they’re saying. When they say, asking for money, I correct them. I’m like, you’re not asking for money, actually, because you are providing something to the person you’re serving. So of course, it’s the least they can do to give you a certain investment because you help them get there. So it’s just a matter of how you see things. Fabienne R.: 34:31 Most of the time when people don’t want to charge is because you said it a bit earlier in that interview, sometimes it’s the ego talking and it makes them feel uncomfortable, for example. So instead of focusing on who you’re serving, what you’re providing, and how much you’re helping that person realize something that they couldn’t if they didn’t have your help. Chris Davis: 34:54 Absolutely. Well said. I won’t add anything else to it. You all heard it live from her mouth to your ears. Fabienne, thank you so much for coming on the podcast. If people want to connect with you, where’s the best place for them to go? Fabienne R.: 35:09 It’s easy, it’s my name, fabienneraphael.com. Chris Davis: 35:14 There it is. I can’t quite roll my R like you did, so I would not repeat it. But it will be in the show notes. Thank you again. I really enjoyed recording this one with you before the podcast and during the podcast. Thanks again. Fabienne R.: 35:31 Sure. It was my pleasure to be on your show. Thank you so much.